The number of British students at UK universities has fallen for the first time in recent history. Numbers are down 1% on last year, while there has been continued growth in the number of students coming from overseas - almost a 5% rise on last year. The Conservatives and others claim the drop in home students has been fuelled by the "raw deal" given to part-timers. The Westminster government says the number of people going to university in England is at an all-time high. 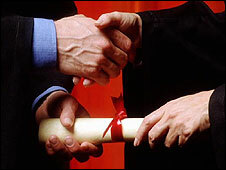 It wants more than half of young people to go on to higher education. The number of UK students at UK universities fell from 1.97 million in 2007 to 1.96 million last year. That is the first fall in numbers since they have been collected centrally. The Department for Innovation, Universities and Skills points out that the 1% fall in UK students is accounted for by falls in British students at universities in Wales, Scotland and Northern Ireland. There was no significant change in numbers of British students at England's universities between 2007 and 2008. England's universities saw an overall 1% rise in students over the same period, although this is only when students from overseas are included. Education policy is devolved to the national administrations. Shadow Innovation, Universities and Skills Secretary, David Willetts said: "We have got used to student numbers growing year after year, but that trend is now over. "For the first time for many years the number of UK students actually fell last year. "In particular, part-time students are clearly being put off by the raw deal they get under this government. "This is the death knell of Labour's target of 50% of young adults going on to higher education." While numbers of home students in the UK fell between 2007 and 2008, those coming from overseas rose by 4.8%. This broke down to a 6% rise in students from other European Union countries (total of 112,150 in 2008) and a 4% rise in those from non EU countries (total 229,640). The number of British part-time students in the UK fell 3% between 2007 and 2008, to 762,340. Wales saw the biggest fall in part-time students from the UK (down 9%). In England, the fall was 3% and in Scotland and Northern Ireland, it was 4%. The University and College Union (UCU) said this was a particular concern. UCU general secretary, Sally Hunt, said: "It is a real worry that the number of part-time students applying to university has dropped. Part-time study is key for students not entering higher education through a more traditional route and will be vital to the success of the widening participation agenda. "In tough economic times we need to ensure that there are genuine opportunities available to people who need to re-skill or gain new qualifications. Part-time study is the only way many people can access higher education and we must support it."